This map comes from the Abbott's Illustrated Counties series of county guides: Dorsetshire, its history, antiquities, places of interest, etc a complete, concise and exhaustive story of Dorset from the earliest times to the present day' The Guide Printing & Publishing Co. Sheets 13-14. (Cary's England, Wales, and Scotland). 2 Blätter : 109 x 53 cm s.n. 2 Blätter : 109 x 54 cm s.n. 2 Blätter : 109 x 45 cm s.n. This drawing represents the relative relief of the landscape by light shading and interlining in pencil. Parallel pecked lines indicate paths across open land. Achling Ditch, a Roman road, runs diagonally across the drawing. To the left of the road is Blandford Race Ground and Telegraph. As well as being a racecourse until the end of the 19th century, Blandford was used as a military training ground by local volunteers from the 18th century onwards. In 1806, a Royal Navy Shutter Telegraph Station was built near the racecourse. The signal station, on the London to Plymouth route, was closed after the Napoleonic War. In the lower section of the map, concentric rings depict the iron-age hillfort of Badbury Rings. This drawing delineates the county borders of Dorset and Somerset with a red pecked line. Pillesdon Pen, a hillfort, is indicated by concentric rings to the left of the plan, although it did not become obligatory to record archaeological sites until 1816. The fort's position, 909 ft above sea level, is depicted by dark shading and brushwork interlining ('hachuring'). The summits of hills in this undulating countryside are left bare. A red pecked line describes the border between the counties of Dorset and Somerset. Telegraph poles are marked by red dots along the lower edge of the drawing, indicating that the area covered is only a few miles from the coast. To the right of the landmass, red circles and crosses mark observation points outside the drawing's boundaries. Archaeological sites are also marked: an iron-age hillfort at Rawlsbury in the lower right is depicted by concentric rings. To the right of this is Dungeon Hill, a hillfort surrounded by a single rampart and a ditch, indicated by shading. 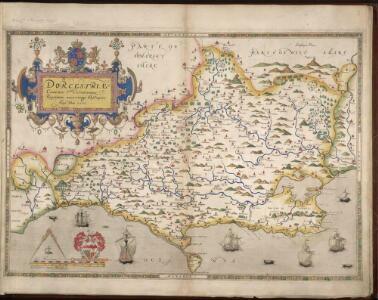 Description: This map of Dorset is from the 1583 edition of the Saxton atlas of England and Wales. This atlas was first published as a whole in 1579. It consists of 35 coloured maps depicting the counties of England and Wales. The atlas is of great significance to British cartography as it set a standard of cartographic representation in Britain and the maps remained the basis for English county mapping, with few exceptions, until after 1750. During the reign of Elizabeth I map use became more common, with many government matters referring to increasingly accurate maps with consistent scales and symbols, made possible by advances in surveying techniques. Illustrating the increasing used of maps in government matters, Lord Burghley, Elizabeth I’s Secretary of State, who had been determined to have England and Wales mapped in detail from the 1550s, selected the cartographer Christopher Saxton to produce a detailed and consistent survey of the country. The financier of the project was Thomas Seckford Master of Requests at the Court of Elizabeth I, whose arms appear, along with the royal crest, on each map. Here the strap work cartouche is mounted by the Elizabethan coat of arms. The Seckford arms of appear at the bottom of the map, adjacent to the decorative scale bar which houses Saxton’s name. The adjacent counties are named but lack any internal detail, recording only the path of rivers that cross county boundaries. Relief, in the form of uniform rounded representations of hills, is the main topographical feature presented in the maps. Rather than provide a scientific representation of relative relief these give a general impression of the lie of the land. Settlements and notable buildings are also recorded pictorially; a small building with a spire represents a village, while more important towns are indicated by groups of buildings. Here Portland castle is marked by a castle symbol of two connected towers. Rivers, streams, parks and woodlands are also depicted carefully. Woods are shown by small tree-symbols, with clusters representing forests, and parklands enclosed with ring fences. Great decorative effect is provided by the detailed images of ships in the stippled sea.